Over the past few weeks, Douglass School has taken the lead in a relief effort to help students in a Florida community that was devastated by Hurricane Irma last month. The project has given the students an opportunity to look past their own struggles, imagine what it would be like to lose everything and consider what they can do to help. 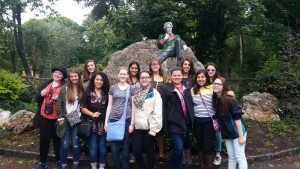 Jim Hoare, an executive with Theatrical Rights Worldwide, traveled from New York to view the students’ interpretation of a version of the Broadway musical that was adapted for use by high school theater groups. He wanted to observe several innovations the students made in set design and stagecraft, to see whether other schools could also use them. On Wednesday, Woodgrove students and staff members will take part in a 1.5-mile “We’re All Human” walk to raise awareness of teen suicide. The walk will be co-sponsored by the Ryan Bartel Foundation, which was created by Ryan’s parents to help prevent such deaths. Organizers say they hope the walk will encourage students who are considering taking their lives to reach out for help. Two Fairfax County organizations have united on a program that provides immediate help to young adults who have recently experienced their first psychotic episode. The Fairfax-Falls Church Community Services Board and PRS, a nonprofit mental health service provider, launched Turning Point last year to help stabilize young people 16 to 25 who have recently had a psychotic break, officials said. The outpatient program aims to improve clients’ chances of long-term recovery by helping them during the onset of their illness. 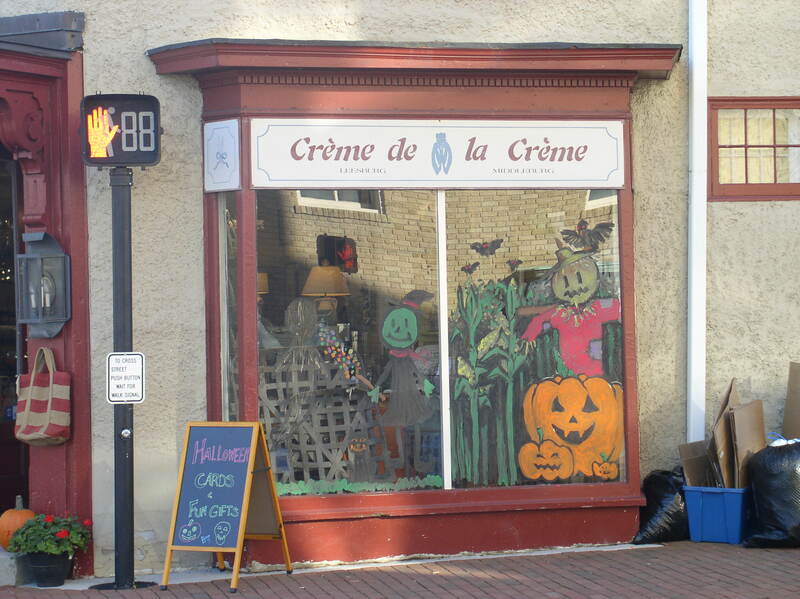 For the next week, the store windows of downtown Leesburg will be filled with ghosts, witches, bats and an assortment of other scary creatures, courtesy of local teens engaged in a friendly competition. Teams of art students from three Leesburg high schools — Heritage, Loudoun County and Tuscarora — are competing in a Halloween art contest sponsored by the Leesburg Downtown Business Association. 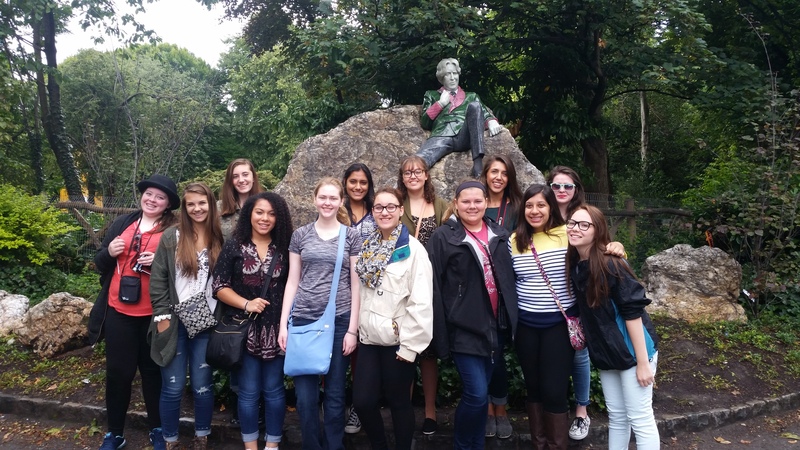 A group of 11 theater students from Rock Ridge High School in Ashburn took their act to the famed Edinburgh Fringe Festival in Scotland last month. All the students performed at the festival — including in an original one-act play written by one of the students — and they saw at least 10 other shows, their teacher, Tony Cimino-Johnson, said. 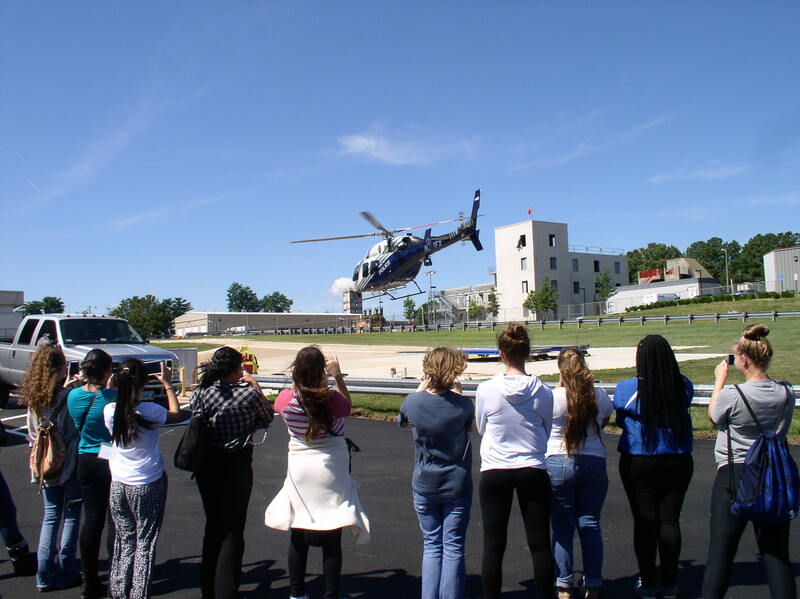 Participants in the law enforcement academy for teenage girls watch as the FCPD helicopter unit takes off in response to a reported stabbing incident. A group of 32 teenage girls from Northern Virginia received an introduction to career opportunities in law enforcement last month in a week-long program conducted by the Fairfax County Police Department. Dozens of law enforcement personnel, most of whom were women, gave demonstrations and discussed their careers with the high school students. The program offered leadership and team-building activities, classes on defensive tactics and firearms safety, and sessions on law enforcement tasks ranging from traffic stops to homicide investigations. About 50 high school students in Loudoun County’s Camp REAL program for at-risk youths hosted an anti-bullying festival Aug. 6 at Sugarland Elementary School. The students organized games, music and activities for younger children, including tie-dyeing T-shirts, face painting and supervising as they petted a miniature horse. Many participants, including members of the Camp REAL program for elementary school students, signed a pledge to help stop bullying.